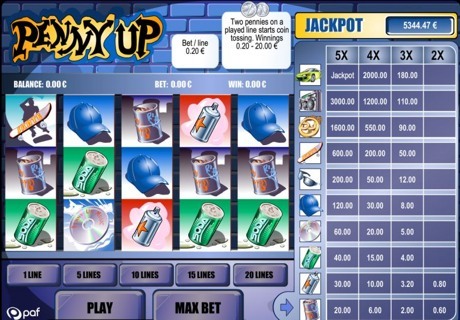 Penny Up is a slot machine with 5 reels and 20 winning lines, where you should try to get as many identical symbols as possible in a row from left to right on a played line. Join the gang and come tossing coins! The highest win is the progressive jackpot which starts at 2,000 euros and keeps increasing until somebody wins it. The game also includes a bonus game where you always win! The bet per line is 0.20 euros. The total bet per game is the bet level multiplied by the number of lines played. The minimum bet is 0.20 euros (1 line x 0.20 euros) and the maximum bet is 4 euros (20 lines x 0.20 euros). The bonus game starts when 2 or more bonus symbols (a coin) show up anywhere on a played line. The amounts won are based on the number of played lines on which two bonus symbols are found. Penny Up’s bonus game takes you back to the excitement of those schoolyard days. Choose a player to throw the coin against the wall and see who wins. The player who gets nearest the wall wins the largest amount, while the runner-up wins a consolation coin prize.